A large number of different NMR methods are of great usefulness in the investigation of molecular mobility in organic bulk systems, while studies at interfaces are rare owing to the low intrinsic sensitivity of NMR methods. 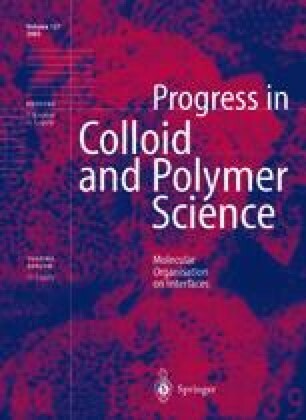 This article presents two examples of the application of spin resonance in investigations of polymers at interfaces, employing polymer-coated colloids: Applying 1H liquid-state NMR to monitor segmental mobility, the phase transition of the ther-moreversible polymer poly(N-isopropylacrylamide) is investigated in the restricted geometry of an adsorption layer, and furthermore under the influence of charges in a statistical copolymer. The phase transition is substantially broader than in solution and for the charged copolymer, mobile segments remain even above the transition temperature. This is attributed to a comparatively mobile arrangement of the copolymer layer. Owing to the electrostatic repulsion from the surface, the copolymer layer is confined to a configuration with charged loops extending further from the interface. The second example concerns polyelectrolyte multilayers formed by self-assembly of polyanions and polycations onto colloidal particles. The hydration of the layer system is studied using 1H spin-relaxation rates, R2, of water, which are a measure for the immobilisation of water molecules in the multilayers. A linear increase in R 2 with the number of layers is found for [poly(sodium 4-styrenesulfate)/ poly(diallyl dimethyl ammonium chloride)]N, reflecting a constant increase in the amount of hydration water with the adsorption of each layer. For [poly(sodium 4-styrene-sulfate)/poly(allylamine hydrochlo-ride)]N, involving a weak polyelectrolyte, the data show reversible swelling behaviour with respect to the electric potential of the outer layer: A positive surface charge leads to a swelling of the multilayers, while owing to a negative surface charge deswelling occurs.